"Where's the kitchen?" were the first words out of Bill's mouth the morning after we left our lovely apartment in Selva. Being in our very cramped, very dated, B&B room in Moena with no goodies like a kitchen or a bathtub was a harsh though predictable change. It had been an idyllic lifestyle for 2 weeks: we had had a very comfortable and pleasing place to call "Home" and we'd been perfectly poised for daily, dynamite hiking. 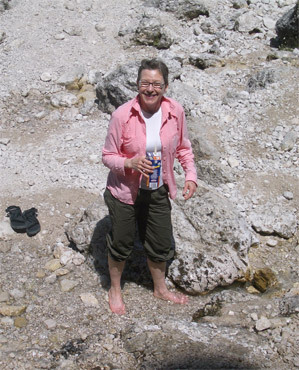 Cooling-down on one of those memorable hikes. Hiking at home, like too many sports, always had the overhead of requiring a 1-3 hour drive to the starting point. At least in the Pacific Northwest, there are great places to drive to for day trips, but there was always that drive. As a young adult, I began judging my pastimes by the extra time required for the outing. Sports like sailing and skiing dropped away because the preparation and transportation time was often greater than the time spent doing the activity. Hiking dropped away too because of the hassles of timing the outing with the weather and the time needed to arrive somewhere scenic. 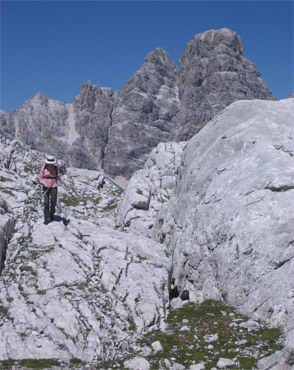 But everything was different about hiking in the Dolomites. Some days the clock started ticking on the hiking time as soon as we stepped out the door, as we were essentially situated on a numbered trail. Other days, the hike would begin after a short walk to a cable car or after getting a lift on a local bus. And trips usually weren't a loop back to the launching point, as we might begin from one cable car and return by another or on foot. And even walking to the grocery store delivered more stunning views than some hikes back home. Delightfully, there was no worry about a car being broken into at the trail head when we were in the Dolomites. The weather was always another drag on outdoor sports back home, with the pleasure of a skiing, sailing, or hiking event being so dependent on the weather. I finally settled on running and then cycling for fitness activities: even though they are most pleasant on a lovely day, they still could be done in most any of our local weather conditions. Hiking in the Dolomites is of course most rewarding in good weather, but we still were happy to get out even in the rain. Heavy clouds didn't obscure all of the dramatic views of the deep valley setting and what could still be seen of the bare-rock bases of the awesome mountains still fascinated us. We could have gone swimming, played ping pong or read on those rainy days, but we always chose to layer on the raingear and do lower elevation hikes instead. The good news for us was that in leaving Selva behind, we weren't closing our hiking chapter for the year. 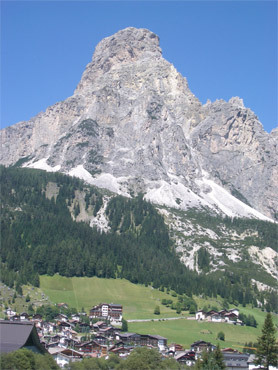 We still had stays at other Dolomite villages that would serve as bases for more hiking, like in Cortina and Corvara. We were quite surprised that riding went well after 2 weeks off the bikes. Our nightly aching muscles reassured us that we'd been building muscle with the intense hiking we'd been doing, but we didn't know if it would translate into power and endurance on the bikes. But hustling up to the top of familiar Passo Sella in record time our first morning on the road confirmed that we did have extra power from hiking. The 2 weeks at about 5,000' above sea level also had given us significant altitude acclimation--acclimation enhanced by some hiking at the 10,000' level. Cycling as well as hiking while in Selva would have been ideal from a training stand point, but we aren't such dedicated athletes and besides, it was our hiking venue. Looking back after zooming up Passo Sella the morning out of Selva. Bill had scheduled a day off after our first riding day back on the road, but we did so well that we decided to press on. We arrived in Cortina d'Ampezza after 3 riding days in which we logged almost 10,000' of elevation gain. That's like starting a sea level and ending at the top of a 10,000' mountain 3 days later. We consider 15,000' gain in a week our usual limit, so we were pleased with our performance despite the significant accumulating fatigue. Our route to Cortina included a new pass on the second day, Passo San Pellegrino. That was a pass Bill had been longing to work into our route for several years and it finally fell into place. However, we won't likely do it again anytime soon. It was a tough pull up the many stretches of 10% grade but at least there was only 1 segment of the 14% grade shown on the map. 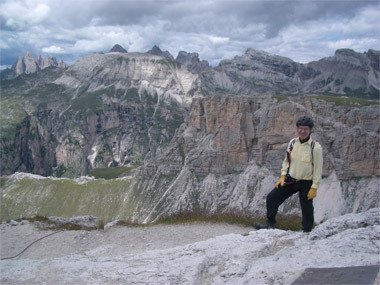 Bill was the hero in planning our west to east traverse of the San Pellegrino pass. It had been an easy decision as on one side of the mountain there was a 14% grade and the other side there was an 18% grade shown on the map. But in this case, the map hid some important details, like the mile and a half of continuous 15% grades that were on what was our down side. And that was the prelude to the 18% segment. We'd struggled going up the west side, but doubt that we'd been able to pedal up the other direction. We'd likely have been pushing with 2 of us to a bike for a mile or 2. Even descending with disc brakes on our heavy bikes was a chore on the extremely steep road with some of the tightest switch-backs we'd ever ridden. The twists and turns were so compressed that, uncharacteristically, his large scale map had smoothed them out into a deceptively straight line--an incredible disservice to everyone, whether on bikes or in a car. Passo San Pellegrino also wasn't a particularly scenic or photogenic pass but it did make for a memorable new approach to familiar Cortina. Cortina was our first Dolomites love--it was the first stop for the night during our first experience of the awesome beauty of those stunning mountains in 2002 (our second year of travel). We arrived in the village on a gorgeous day with our mouths agape from riding surrounded by the towering peaks and will always have a deep inner smile upon hearing "Cortina." Even the upscale village department store where there was a wonderful selection of much needed socks delighted us and we shrugged off the high prices at the supermarket as we were grateful for the improved food selection. When we pedaled into Cortina that first time with the brilliant blue skies making a dramatic backdrop to the many peaks, we thought we'd arrived in a bit of heaven on earth. As we've explored more of the Dolomites, Cortina has slid down the scale of favorite places to be, but it will always be remembered fondly as "the first." The view from one of the high plateaus near Cortina. Like its neighbors, Cortina has a stunning setting but is by far the most upscale of the Dolomite villages. And we can't help but wonder if our feeling of being economically squeezed out isn't by design. In 2002, we were the last clients for a woman closing her centrally-located, budget-priced B&B and we couldn't understand why it wasn't being sold instead. Unlike most Dolomite villages, Cortina just didn't seem to have much budget-priced lodging and hers was among the last of the breed. We now suspect that its unfriendly lack of price range in lodging is the result of a deliberate community policy. We now push the top end of our budget by staying at one of the few 2 star hotels in town, but only in July. The hotel is closed in June and its prices jump to over $200 per night in August. Cortina's tourism literature proudly boosts its 250 luxury stores for "shop-aholics". And the relatively "old money" culture shows on the pedestrian mall, especially as the kick-off to high season draws closer. 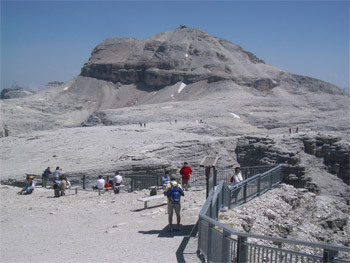 The over-tanned, over-glided, and heavily costumed people start increasing in numbers among the obvious tourists in their proper hiking wardrobes. And the Asian tourists that were missing in the bustling Val d'Gardena street scene of tourists were present in Cortina. Not in the usual tourist busloads, but groups of a dozen or less looking like seasoned hikers with their rucksacks and trekking poles. Perhaps it is Cortina's history of being an Olympic venue in the 1950's that puts it on the map for them. Apparently it had been rough in Cortina the week before we arrived, as there were at least a half dozen solemn funeral processions that wound through the center of town the 4 days we were there. "Only in Cortina" I thought as it became apparent that the hot hearse to have surrounded by mourners on foot was the PT Cruiser. I didn't even know they made PT Cruiser hearses but here they were, in Cortina. This year, like several others, our memories of Cortina as the gateway to the Dolomites are a bit tarnished by it being the place of problems for us. 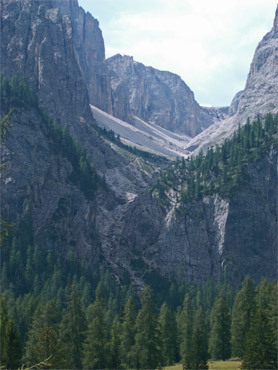 Several years ago, we had our camping gear mailed to us in Cortina. Only 2 of the 3 boxes arrived, and we were inconvenienced for weeks while the missing package situation was resolved. We finally sent the 2 boxes back home, as they were useless without the contents of the missing third box. Of course, then the errant box arrived. An Italian postal worker had put an Italian form over the US postage and then a worker down the line declared the package as "Postage Due." The whole debacle set us back a few hundred dollars and put an end to our camping season before it began that year. It's hard no to remember that episode when in Cortina. This year, memories of our Cortina stay will be clouded by several aggravations. 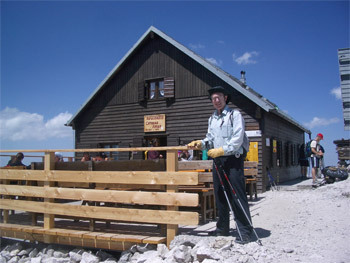 First, Bill had planned an overnight stay in a mountain hut, sandwiched between 2 days of Via Ferrata hiking routes. But bad timing on our part resulted in us being told that the hotel wouldn't hold our luggage and bikes for the night away but would only hold the room and charge us for the unused night. Days later we learned that the manager would have permitted the arrangement, but the window of opportunity had closed. Bill had invested hours and hours in planning and in making difficult, second-language phone calls in the process and was crushed to have it ruined. Never being one to favor the "silver-lining" theory to disappointments, I must say that having our refugio outing squelched was just as well, despite the clearing in the weather being perfectly timed. We arrived in Cortina with a lame laptop and we ended up spending hours of every day in Cortina working towards getting a new battery. Our fist efforts were with the one office in Italy that could order the battery for us, then the plan shifted to the one office in Austria that could place the order. Despite the headaches, our guess was that it would ultimately be easier to buy the battery in Europe than having it mailed to us from the States. We tried to keep our troubles in perspective by reminding ourselves that Cortina was a lovely place to be stuck with having to solve problems. With the exception of 1 day, we did get into the mountains for abbreviated hikes. We'd schedule time first thing in the morning and late in the afternoon for emails and phone calls and duck out for long lunch break hikes. And like from Selva, Bill confronted some old demons on the mountains. One day we hiked to the point at which Bill didn't feel safe passing in the past--the place where we had to turn around. This year, with his new confidence in his feet and his high-heights skill, we were able to go on. It was a wonderful affirmation of how far he had moved beyond old, self-imposed limitations. Then: Bill was stymied by the steepness halfway to the top. Now: "Ta-da!" He charged up to the hut on the peak. No doubt we'll be back to Cortina again next year--in July. We'll email the manager of our 2 star hotel in advance and set up the overnight refugio stay in advance. That will be a gamble on the weather, but at least we'll escape paying twice for one night's lodging. And perhaps, like the first time, we can cruise through Cortina without a crisis to resolve. 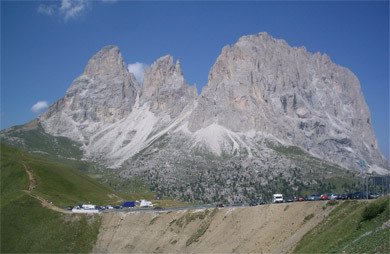 Inclusiveness is one of the aspects that we treasure about the Dolomite summer scene: there is something for everyone. Adrenaline junkies can get their fix flying through the air or climbing sheer mountain faces while their family members that are too smart, too young, too old, or too infirm can have a wonderful time too. It was in Corvara, a day's ride from Cortina, that we personally capitalized on that diversity as Bill joined the ranks of the infirm. We left Cortina and headed towards Passo Falzarego on Saturday morning knowing that Bill was a bit under the weather, but high season began that evening and Cortina was booked for the night, so we had to go on. We'd both had a mild GI upset all week and had both been experiencing some upper respiratory distress as well. I was lucky in that I had my usual mild presentation of symptoms: a few hours of sore throat 1 day; a few hours of general icky feeling another day; a few hours of sniffles; and about 4 days of lung crud that I had thought was from the encroaching valley pollution. It was on this Saturday that my lose assemblage of symptoms was recognized as being a bug and Bill's allergy episode was revealed as a more severe form of the same cold when he started to 'melt down' on the road. We'd climbed both about a third of the 3000' elevation gain and a third of the 12 miles to the pass when Bill began slowing way down. We'd gotten a late start because he felt bad and that put us out in the considerable late morning heat, which wasn't helping. Then we got hit with a passing downpour which, though dramatically lowered the temperature, didn't improve his performance. Then there was the matter of the road closure sign at the beginning of the route. We'd decided to press on to the top of the pass and access our options then, but Bill's rapid deceleration would leave us little time for finessing solutions once there. We happened to stop for rest and reassessment at the last village on the road to the top--one that happened to have a bus stop. There we discovered that one of the few buses of the day going to the top of the pass would be by in 10 minutes, so we scrambled to the official stop, unloaded our bikes, and crossed our fingers. Predictably, the driver's assistant said in fair English "This is not a bus for bikes." We've done enough traveling in Italy to know that instead of "No, you can't put your bikes on my bus", he was really saying "I don't want to be bothered." I ignored his logic and suggested the bikes and bags could go in one of those grand luggage compartments in the belly of the near-empty bus. After a bit of fussing, he reluctantly dislodged himself from his seat and opened a compartment with the narrowest of doors; Bill struggled to squeeze my bike in. The driver finally caved in and invited me to the other side of the bus to easily slide Bill's bike into a full-sized, totally empty compartment. Too soon to celebrate though, as we needed to quickly stuff our bags in around the bikes with an air of humility. Though once underway, Bill muttered "It may not be a bus for bikes, but they had no trouble coming up with a special ticket and price for the bikes". As we unloaded the bikes and gear at the top, I again thanked the assistant and did my best to explain that Bill was ill and had been unable to bike any further. Our biggest obstacle of the day was behind us, which was getting Bill up the pass. While he waited with the gear, I rode my still unloaded bike the mile or so to the next mini-summit--the site of the road closure. Luckily a German cyclist just passed through the road barrier and confirmed that despite the landslide ahead, the road was barely passable by bike. Of course, going around the barriers at the construction site with her ultra light bike was easier than with our utility-vans masquerading as bikes, but she thought we'd manage. She had fond memories of the time she'd spend in southern Oregon and was happy to answer all of my roadwork questions between rounds of reminiscing. Fortunately, she was right, we were just barely able to pass. The workmen politely ignored us though didn't do much to help either. We partially unloaded the bikes to get around the workshop area set-up in the middle of the closed road part way down from the pass and then we continued our delightful, traffic-free descent without interruption. Chancing getting past the road closure area saved us a long detour on a day when Bill had little reserve. We might have been able to worm our way on another bus to shorten the route or get a lift up the additional pass, but didn't want to risk it. As it was, Bill had to stop repeatedly over the last 3 miles of moderate grade to get into Corvara proper, even though most of the afternoon riding time had been coasting downhill. It was the next morning when Bill's condition had worsened that he finally diagnosed himself as having viral pneumonia. His accelerating shortness of breath had had him practically panting the night we arrived in Corvara, even as he soaked in the tub. It was clear that his stay in Corvara wouldn't be hiking the high peaks (like these below) as he'd planned, but instead he'd be shuffling the village sidewalks with the other compromised vacationers. Above Corvara: Passo d'Gardena (lower left) with its serpentine approach & the high, pointy peak we hiked up (left of center). Luckily Corvara, unlike Cortina, only had a 2 week high season, which was still a week away, so we were easily able to extend our stay from 3 nights to 5 and then to 6. His previous vaccination against bacterial pneumonia would prevent his disease from escalating, so there was little to do for him but to rest and wait. As Bill mapped out a hiking route suitable for me to do alone, I mapped out an "Invalid Day" itinerary for him. Like other Dolomite ski resort towns, Corvara would support him with loads of pleasant sensory stimulation during his recovery. I suggested he put his picnic lunch and a book in his rucksack and spend as many hours out of the room as he could tolerate. The view from Corvara's grocery store. Within a 2 block radius of our B&B, he had at least 3 interesting sitting venues. The narrow park dense with conifers had a noisy mountain stream running through it where he could either watch the antics at the shaded playground or find serene solitude. If he wanted to warm himself in full sun, there was the mini-plaza in front of the tourist info office, which would also offer some interesting people-watching options. And lastly, the bus stop benches near the valley department store had one of the best mountain views in town..
And indeed, Bill had no trouble entertaining himself outdoors for as long as he could sit up. He started at the mountain stream park a couple of minutes shuffle from our door, then moved on to the entertainment of the children's climbing wall before settling into a sunny meadow space. He wasn't in the meadow long until he discovered he'd situated himself in the middle of the landing area for the hang gliders, so retreated to a nearby bench to watch the show. Later he amused himself by buying a children's story book in Italian to enhance our language studies. Not long after lunch in the meadow however, it was time to retire for deeper rest in our room. . The next day he felt enough perkier to do our grocery shopping at the market a block away; checked for hoped-for email messages about our computer battery on order in Austria at the pricy public internet point at the Tourist Office; and indulged in another outdoor picnic. He was relieved to feel that his worst day was behind him, but his afternoon implosion dashed his hopes for a hike the next day. Bill slowly improved but failed his early "road worthiness" test on a short, steep walk near town. The exertion triggered fits of hacking and coughing that helped move the crud out of his lungs and would reduce the risk of a secondary infection, but didn't bode well for biking. We extended our stay for a second time to give him a longer respite and me a few more cautious hikes on my own. One of Barb's solo hikes was up this gorge. We did finally receive the longed-for email that our laptop battery was indeed on order, so it was looking like Bill and the computer would be recovering about the same time. Now all that we needed was a break in the heat wave that was causing raging wildfires in Croatia, our next major destination, so we could resume our tour in earnest. Bill was aghast and uncharacteristically judgmental at the "father like son" teaching he observed at breakfast one morning in Corvara when a substantially overweight dad unwittingly guided his young son on becoming obese. The boy heaped 3 spoonfuls of sugar into his small cup; dove into a pile of a cake that papa had brought to the breakfast buffet; and mimicked dad's satiation gestures of rubbing his belly as he leaned back on the bench at the end of the meal. It had only been a week earlier that we'd read a new medical study indicating that social ties were a more important predictor of obesity than genes and this kid was potentially getting a double whammy. Bill, who was a tubby child, lamented the lifelong challenges before this boy. This father-son incident prompted further pondering of the importance of mimicry in socialization and how much of our learning as children and adults comes from copying the behaviors of others. Our success as travelers clearly has been increased by active observation, from learning how to cross difficult intersections in Athens by watching the stray dogs to knowing when not to put used toilet paper in the toilet. One is severely disadvantaged if they don't take cues from those around them and yet, as with this lad, mimicry can have its shortcomings. A recent, successful bit of mimicry was also etched in my mind from our stay in the Dolomites. At the summit of one day's hike, I observed a woman my age or older speeding down the steep hillside before me, a slope made slippery with the usual lose, gravel-sized rock. My tender knees and tendency to slip backwards off my heels would have me slowly picking my way down this same slope. I can charge up the steep slopes but must creep at a snail's pace downhill and had been unable to improve my speed. There was never a shortage of footing problems. Even as she was quickly moving out of sight down the mountain, my yoga-teaching-trained eyes dissected her movement pattern. Her lack of a backpack and her unattractively tight clothes made her exaggerated stance easy to capture: she projected her ample buttocks far behind her, deepened the natural curve in her low back; tilted her torso seemingly too far forward over her knees; and generated a rapid staccato movement with her feet. Our body types could hardly have been more different, but I wondered if we had similar body mechanics issues. As the image took hold in my mind, I hoped her absurd looking descent style would work as well for me. Happily, the technique she had refined was a perfect fix for my descent problems. After confirming that, I intentionally cemented her image in my mind and labeled it as being like a shooting gallery duck that bobs forward and back. It is a position of controlled falling, hence the busy feet. Like her, I kept my quick-stepping feet gyrating up and down and integrated any falling motion into the pattern. My trekking pole held forward to catch me was very reassuring as I experimented with her technique on our many steep descents but hopefully, like her, I'll feel less need for it as I master her skill. Too bad she whizzed by so fast, never to be seen again, as I wasn't able to thank her for the invaluable lesson she taught me that day, a powerful, positive lesson learned by mimicry. Mind Games on the Road #2: "What if it gets worse?" Anytime one has a new health glitch, there is that interval of uncertainty: "Is it significant enough to require professional help?" and "Will it get worse suddenly or better on its own slowly?" Those thoughts can quickly shift from considered musings to crisis-level ruminations when thousands of miles from easily accessed medical services. Though we are in first-world countries most of the time, we've learned from experience that the health care professionals in Europe would rather we go home for our medical care. Certainly if we were in a medical crisis we'd get the care we needed, but it's those gray-area problems that leave us feeling trapped. One example was this May when Bill began choking on some vinegar marinade that he had been slurping. Instead of splatting the staining beet juice out into the room, he opted to suppress the gagging, which resulted in the vinegar solution being forced into his nasal sinuses. Searing pain was his body's way of immediately informing him that it had been a bad choice. And despite being spared the messy clean-up job on the walls, it was one of those health situations that got worse before it got better. The increasing sense of pressure and discomfort the next day had him worrying that a fragment of beet particle had gotten lodged in his sinus--a tissue (unlike lung) that has no mechanism for removing such large particles. Then when a clear fluid spontaneously dribbled out his nose, I made what I thought was a joke in commenting that I hoped it wasn't his brains leaking out. Bill knew too much: he knew that indeed it was a thin barrier between the brain and the nasal passages and injury to the tissue could indeed cause brain fluid to leak out his nose. We would have just laughed, but his condition was getting worse by the day, not better. But what to do? If we were at home, we'd probably have done nothing but taken great comfort in knowing that whatever the time of day, he could seek assistance when his tolerance for "wait and see" was exhausted. If it was indeed an emergency at that point, we'd have little trouble tapping into the medical system for his care. But being abroad and dealing with language barriers makes it less safe to wait so long and yet the obstacles to getting care would be great enough to make us want to postpone getting medical help until we were sure it was necessary. A squirmy Catch-22. Fortunately, after getting worse for several days, Bill was certain he was recovering and "his brains leaking out" could become the joke that was intended. He was convinced that all of the discomfort and unpleasant symptoms had been due to the irritation of the vinegar and nothing more consequential. We each have an episode or 2 of such medical curiosities every year while traveling and they are unnerving. Each time a worrisome set of symptoms arises that could point to serious trouble, we have to run the scenarios and craft a several action plans. Usually, as in this case, a week of watchful waiting is enough to put our minds at ease, but we are well aware that it is a source of stress that we wouldn't experience to the same degree were we at home. Bill's recent episode with his bad cold and viral pneumonia, though alarming, generated ordinary enough scenarios that it didn't cross the line into this unnerving mind game that we sometimes experience. He got very discouraged with how sick he was and how slowly he recovered, but it was all within the "acceptable" range of outcomes so stayed well contained in our minds. For those who thrive on details: we are in Starigrad, Croatia, a coastal village near Zadar. At 8:45 am tomorrow we'll be standing on the roadside trying to flag down a speeding bus so as to make the 4+ hour trip north to Opatija, near Rijeka. There we will rejoin our bikes and gear after an 11 day hiatus in our biking. Hopefully, my rear hub parts (ratchet and pawls for those 'in the know') will arrive soon from the States and Bill can fix my incapacitated bike. If all goes well, on Saturday we'll resume the bike trip south along Croatia's coast that we expected to begin 2 weeks ago. We plan on being in Croatia until the end of September. We'll then take a boat across Adriatic to the southern Italy coast and from there will work our way to Sicily, where we'll finish out our biking season in early December.